Arguably, a leading cause of business failure is not having any type of strategic plan. If a business has little idea where it is headed, it will wander aimlessly without priorities, changing constantly, and with employees confused about the purpose of their jobs. This is why corporate strategic planning is critical to business success, even if the planning process takes time and resources. 1) Strategic planning provides clarity, direction, and focus for your organization. Perhaps the most obvious reason to engage in corporate strategic planning is that it provides direction and focus by way of a written document. Having a clearly articulated mission and vision enables the company to develop a strategic plan that is a literal roadmap for success. Confusion and day-to-day business fires are often reasons why strategic planning yields little results, but these risks can be mitigated by having a plan that is written down, with clear assignments, dues dates, and deliverables, so that employees know what must be executed by when. Start building your strategic plan today with this valuable template. This four level strategic plan template will help you create a plan that’s optimized for execution. 2) A strategic plan drives organizational alignment. A strategic plan isn’t just a document to keep everyone on track. Having everyone participate in the strategic planning process fosters collegiality and creates an opportunity for discussion on the direction of the organization, which is why strategic planning often results in cultural transformation. In addition, the process promotes the open and creative exchange of ideas, including resolving disputes and working out effective solutions. 3) A plan communicates your message. Even if you have strong mission and vision statements, most leaders walk around with a virtual strategy locked in their heads. The CEO inherently knows the organization’s strategic direction and the tactics that need to be executed. Unfortunately, if the strategy isn’t down on paper, or if only a small handful of people know the priorities articulated by the strategy, then the likelihood that the strategy is executed effectively is greatly diminished. This is why strategic planning is so important – serves as a communications vehicle for what must be done to create short- and long-term sustainability. AchieveIt’s cloud-based software is the ideal technology for answering the question, “why strategic planning?”, as it enables organizations to manage and track the execution of every type of plan in real-time – whether strategic plans, operational plans, project plans, or quality improvement plans. What Makes a Good Example of a Strategic Plan? Many companies are looking for help, searching for an example of a strategic plan as a yardstick they can use to compare their own plans. But strategic plans can come in many forms, shapes and sizes; they are not a “one size fits all” document. There are simple strategic plans that include goals, objectives, strategies, and tactics, as well as complex plan structures that include multiple levels and layers. How developed your plan needs to be depends on several factors, including the level of accountability your are trying to create, the time frame for implementing the plan, and the culture of your organization. In this post, you’ll see an example of a strategic plan that is most common among businesses today. Tactics: These are task assignments that must be carried out on an individual basis. These action items comprise the strategies. For instance, if you have a client satisfaction strategy that focuses on an annual client event, there are a number of things that must be completed in order for the event to happen. These are the tactics, which include due dates, deliverables, and are assigned to specific people for execution. Strategies: The collection of the tactics need a name, and this name is the strategy. The name of the strategy provides the focus for something specific, and the strategy itself contains the individual tactics. As such, strategies are the broad action-oriented items that we implement to achieve the objectives. In this example, the client event strategy is designed to improve overall client satisfaction. We may have additional strategies aimed at improving client satisfaction, and each of these other strategies will have a collection of tactics, too. Objectives: These are quantifiable and measurable targets, that answer the questions of how much, by when. There is an old adage that you can’t improve what you don’t measure. As such, plans without measurable objectives are not plans at all; they are merely task lists. Objectives include baseline performance, targeted performance, and an established date for achieving the objective. Any example of a strategic plan must include objectives, as they are the foundation for planning. In this example, our objective is to increase client satisfaction from 82% to 90% by December 31, 2017. How we accomplish that is the business of strategies and tactics. How do other leaders use AchieveIt to access live plan metrics and statuses to help prove incremental performance? Objective 1: Increase client satisfaction from 82.0% to 90.0% by December 31. Strategic Themes: These are one- to three-word affinity group headings used to compartmentalize strategic and operational plans, such as Quality, Safety, People, Customers, Service, Finance, and Growth. For companies that use strategic themes, four to six such categories appear to be the most common. Goals: These are broad statements that translate the organization’s vision statement into something more meaningful and time-bound. If strategic themes are also used, goal statements are used to translate the vision to specific strategic themes. Keep in mind that there are many acceptable formats for strategic plans and you should use the approach that is right for you. Some companies prefer the one-page approach and others don’t adhere to specific approaches other than perhaps implementing a basic structure like the ones above. Either way, remember that creating a strategic plan is only the beginning; the hard part is executing it. That’s when you call AchieveIt. AchieveIt’s Execution Insight Platform is a web-based solution that is purpose-built for executives to get a view into the performance and execution of their critical, high-level initiatives, which is not easy to get in either spreadsheets, email or project management systems. It features custom dashboards (no more Excel hell! ), automated email alerts and the ability to see not just your data, but the critical context behind it, so you get a full picture of how you’re executing your strategic plan, in an easy, efficient and effective way. Organizations spend a lot of time and resources putting together business plans. However, many organizations are guilty of not dedicating the same amount of focus to executing them.Get out of Excel, Outlook and PowerPoint. Effective execution – not just a great plan – is the only way to amplify the impact of your organization. Successful strategic leaders make good on their planning investments and drive results by using AchieveIt’s software and services to promote accountability, visibility, collaboration and alignment. Executive leaders looking to overcome the challenges of execution will get a view into the performance of their critical, high-level initiatives with platform features like customizable dashboards, smart email alerts and the ability to see not just your data, but the critical context behind it, so you get a full picture of how you’re executing, in an easy, efficient and effective way. AchieveIt offers not only an intuitive Execution Insight Platform, but also a full Customer Success Team to provide ongoing support. Your designated Customer Success Manager will work with you to make your existing plan the most effective it can be, upload it into the web-based strategy execution software and on-board your software users on site. AchieveIt’s Customer Success Team has seen the implementation of thousands of plans, and will continue to support your organization with best practices, training and insights along the way. In this strategic plan example, we review the structure of a strategic plan for a hotel chain and include elements of the plan itself. New England Hospitality Company, a fictitious company that owns and operates 37 hotels, is embarking on its first strategic plan and will be used for this strategic plan example. To help identify the primary areas of strategic focus – and to gain consensus among its management team – the organization agreed to focus its strategy using specific tools, and to also use a five-level hierarchy of strategic themes, goals, objectives, strategies, and tactics. In the current competitive landscape, it’s not strategy that separates good businesses from great ones, it’s execution. In order to drive successful strategy execution, you need to be able to align your organization to your goals and to see how you’re executing against your most strategic, high-level initiatives at any given time. You can’t do that with spreadsheets or project management systems that are meant for granular project-level tactics and details. 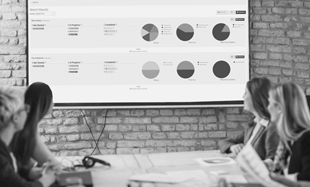 The AchieveIt’s Execution Insight Platform is purpose built help you operationalize your strategy execution and solve the specific challenges around alignment, visibility accountability and team collaboration. It’s an easy and efficient web-based software solution designed to help you execute with excellence and achieve better results. Watch the video to get a sneak peek of the solution and schedule a full demo today! Strategy Implementation for Higher Education. Most higher education institutions do their planning — whether it be a strategic plan, facilities plan, fundraising plan, operational plan, etc. — in spreadsheets. LOTS of spreadsheets. But as you execute, your organization and your plans get out of alignment. Spreadsheets are just files… in order to keep the status of the plans in them current, someone – YOU – has to chase down, collect and combine input from other people. So you spend hours and hours hunting down colleagues, cutting and pasting from emails, combining spreadsheets… instead of driving better execution. Watch the video below to see how other higher education professionals can get out of Excel hell and improve implementation. Learn how Texas Tech manages their project load and progress tracking across multiple locations. The idea of strategy implementation failure is enough to keep any strategy director up at night, and definitely capable of inspiring a few horrific career-related nightmares. Yet there are steps you can take throughout the year to build a more implementable strategy, and correct course if you’re already in execution mode. AchieveIt’s Director of Professional Services Joe Krause was featured on Biz 1190’s The Eric Holtzclaw Show to discuss his views on strategic planning and strategy implementation. With his 20+ years of experience as a serial entrepreneur, Eric Hotlzclaw’s radio show discusses topics relevant to those trying to build and grow their businesses. His interview with Krause outlines four things any organization must do to avoid strategy implementation failure. Leaders must view tasks and projects in a way that reflects back to the overarching goals of the organization. Otherwise, you and your team are putting in countless hours of work and effort, just to find out that those goals and objectives still haven’t been met. If you really want to see results, it is crucial to create a cadence of accountability within your team or organization. This includes establishing clear deliverables, firm due dates and straightforward ownership. If team members are unsure of what they are responsible for and when items are due, you are bound for strategy implementation mayhem. It’s also important to decide on an update frequency that works best for you and your team– should your team provide status updates daily, weekly, monthly, etc.? This may vary depending on the urgency and nature of the specific project, but is nonetheless essential to establish these expectations up front. Consider sharing status updates from your team, rather than just keeping them for your own reference. Creating transparency allows for ongoing inspection by everyone in the organization. And ongoing inspection will send accountability into the atmosphere. Many organizations use items like “work harder, not smarter” or “foster a culture of accountability” as action steps within their strategic plans. And although these are great in theory, it leaves little to no room for actually tracking your strategy implementation progress. When you support every piece of quantitative information with qualitative, you provide yourself with context to make the best decision possible. It gives you the “why” behind the numbers. So whether it’s good or bad, you can have a bit more clarity on how to move forward. Using a software tool to help you implement your strategic plan will remove much of the burden associated with creating, tracking, assigning and reporting. You need to decide on a platform that gives you the right amount of flexibility and structure with your strategy implementation. Check out how AchieveIt’s Execution Insight Platform can help your organization gain both meaningful intelligence on execution and the ability to drive results with it. Organizations are spending more time and money than ever on the creation of strategic plans, yet the majority still aren’t achieving the results they need. Bridging the gap between strategy and execution won’t happen overnight, but to reach your desired goals and targets, successful strategy execution is critical. 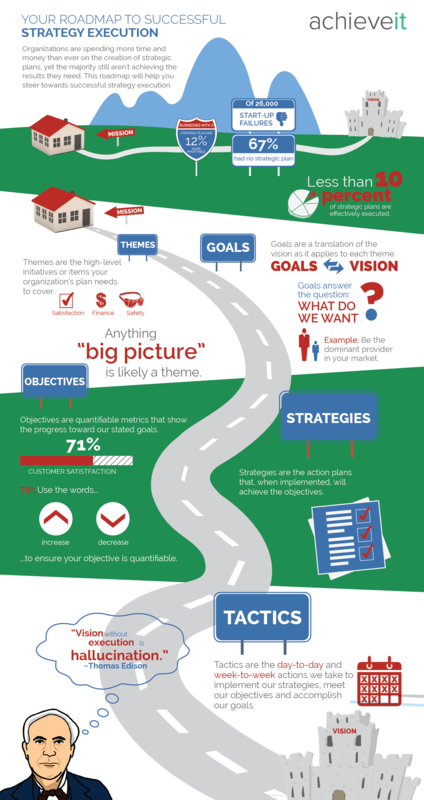 We have put together the infographic below as a roadmap to help you steer towards successful strategy execution. If you find this infographic helpful, you’ll likely love our Execution Insight Platform. It’s finally time for successful strategy execution. Instead of wasting time chasing updates, drowning in spreadsheets and emails, and still having little insight into how your organization is actually implementing against its plan, try our strategy execution solution. AchieveIt’s Execution Insight Platform is a web-based strategic planning and strategy execution solution that is purpose-built to solve the challenges of strategy execution. It gives executives a view into the performance and execution of their critical, high-level initiatives, which is not easy to get in either spreadsheets, email or project management systems. The platform features customizable dashboards (no more Excel hell! ), smart email alerts and the ability to see not just your data, but the critical context behind it, so you get a full picture of how you’re executing, in an easy, efficient and effective way. It’s the only solution available that provides both meaningful insight into how you’re executing and the ability to drive results with that insight. Stop drowning in emails and spreadsheets and start driving better results. Watch this 90 second video on how to improve strategy execution today. AchieveIt’s goal is to help business leaders bridge the gap between strategy and execution. The AchieveIt Execution Insight Platform is a Web-based software solution that was purpose-built to solve the problems of strategy execution. No other solution provides meaningful intelligence on execution, eliminates the need for spreadsheets and reduces the time spent gathering strategy updates by more than 90%. So far, we’ve helped more than 300 companies drive better results by giving them an effective and efficient way to understand how they are executing against their most critical initiatives at any given time. Management planning tools often focus more on the planning, less – if at all – on the execution. But it’s strong execution that separates good companies from great ones. You need a solution that helps you execute in a smarter, faster and better way. AchieveIt’s Execution Insight Platform is a web-based solution that is purpose-built for executives to get a view into the performance and execution of their critical, high-level initiatives, which is not easy to get in either spreadsheets, email or project management systems. It features customizable dashboards (no more Excel hell! ), smart email alerts and the ability to see not just your data, but the critical context behind it, so you get a full picture of how you’re executing, in an easy, efficient and effective way. Get a Live Demo of The Top Management Planning Tools Today! Gazelles’ One Page Strategic Plan is one of the most popular strategic planning templates available on the market today. Created by Verne Harnish in his book, “Scaling Up: How a Few Companies Make It…and Why the Rest Don’t,” this approach to strategic planning is meant to help businesses simplify their strategic priorities and create a plan that is both actionable and effective for growth. Defined as ‘Rocks’, strategic priorities define the actions and the involved stakeholders for the business’s quarterly activities. Executives are asked to complete a Core Values/Beliefs section, as well as a Purpose section, to define the direction of the organization moving forward. Building on this foundation, executives then complete five ‘Rocks,’ or quarterly objectives, and assign an accountable party to each Rock. By limiting executives to five priorities per quarter, the Gazelles system is meant to encourage focus on the largest drivers of organizational growth. When it comes to resources, the primary concern is the people necessary to execute the aforementioned Rocks. Executives are tasked with enumerating the people involved with execution, assigning accountable parties to Rocks, and determining the critical number of people necessary to achieve objectives. The purpose of the exercise is for executives to gain insight into the productivity and utilization of their employees. Upon seeing how many employees are aligned with strategic Rocks, and how many are not, executives can reallocate employees to the organization’s highest priority objectives. Here we explore both the key financial drivers of the organization at large, as well as the financial impact of the organization’s headcount. The One Page Strategic Plan includes current and expected financial metrics from the balance and income sheets, including revenue targets, profit margin, cash, accounts receivable, inventory turnover, and revenue per employee. By listing these financial drivers, executives can correlate the strategic priorities and allocate resources accordingly. 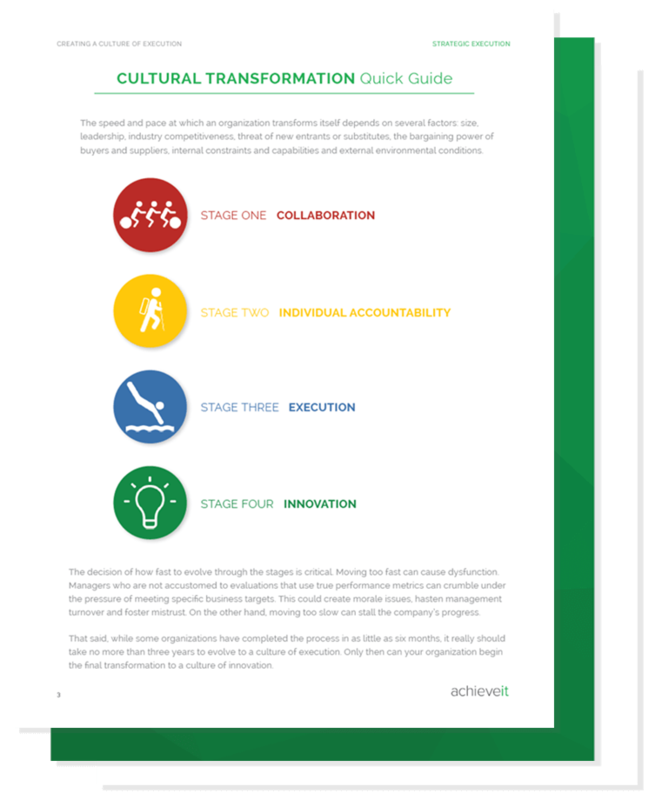 Building on the three themes listed above, Gazelles approach to strategic planning enables executives to explore a collection of key business drivers. These are broken down into organizational timeframes: big picture, three to five years, annual, and quarterly. What is our core mission, and what is our vision moving forward? What is our organization’s purpose? What are our Big Hairy Audacious Goals? Where will we be in 10 years? What are the opportunities and threats in our market? What are our priorities over the next three to five years? What are our financial targets over the next three to five years? What is our brand promise in the market? What are our Key Performance Indicators (KPIs) for this timeframe? What are our most critical priorities this year? What are our most critical financial numbers this year? What are our most critical KPIs (key performance indicators) this year? What are the objectives that everyone needs to be focused on, and accountable to, in our day-to-day operations? What is truly unique about Gazelles’ One Page Strategic Plan, and that approach to strategic planning, is the focus on growth. With this template, priorities are set with a special focus on the financial resources and the people needed for execution, which is why many people believe Gazelles provides a strategic planning format built specifically for strategy execution. But planning is only as good as the actions that follow, so it is important that once the template is complete, it is placed into an environment that allows for the assignment and tracking of outlined priorities. This is where AchieveIt can help! Contact us today to see how our business insights platform can help enable the execution of your strategic plan.